At the time, I was getting freelance work from vWorker, and I started to see a lot of requests asking for coders to work on various Twitter-based applications. 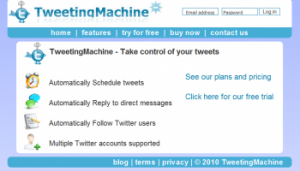 Some people wanted to create sites that let users schedule tweets; others wanted to be able to automatically follow people back; and some shady characters wanted full-on spam engines. I was looking for an excuse to learn Twitter’s API, and the more I thought about it, the more I realised that I could write a web app in my free time with lots of great features, that would be easy to use, and in no time it would become the number one Twitter tool! Not only that – I could charge to access it… and people would sign up, and use it, and love it, and inside 90 days I’d be making tens of thousands each and every month! I had my great idea, time to get cracking on what would turn out to be the easy bit: writing the code. I’m a web developer – have been for a decade – and I know how to write web apps. Find a cheap VPS (prgmr.com – incidentally, highly recommended and have far exceeded my expectations), sketch out some database and object designs, choose a framework, and that was me up and running, coding like a demon for a good few weeks. My girlfriend and I (along with her sister, for that matter) had decided to escape Poland’s chilly winter, and spend three weeks in India instead. A fantastic time was had by all, and I occasionally managed to stop thinking about the millions of dollars that MUST be waiting in my PayPal account. Arrive back home. Check emails. Zero sales. Check server. Apache has been crashing. Cron jobs not running. Sit down. Cry. Fix up the code. Go work on something else. I should stop here to explain what I originally thought my pricing plans would look like: I was offering tiered pricing – if you wanted to use multiple Twitter accounts, it’d cost you more… and if you wanted to send more messages, that would cost you as well. Enjoying taking rash decisions, I decided to scrap the tiered pricing, and stick to a single price: $9.99/month, with a week’s free trial beforehand. Surprisingly, within a week, I had my first sale. With $9.99 in my PayPal account, I was halfway to breaking even on my monthly hosting costs, a small triumph! That said, I was starting to notice a rather nasty trend: my visitor numbers were dropping, sharply. If this carried on, I would have maybe a single visitor per day in the next month. Not having any marketing skills, I was starting to wonder what I should do. I was at a loss, and started to read every basic guide out there for how to market your web app. All of them made it seem so simple: find relevant websites and blogs; contact authors and owners; ask for a review or if they’d let you publish something; and then sit back and watch the targeted visitors pour in. Sadly with TweetingMachine that didn’t happen. I started to realise that its design could really be holding the tool back… but I don’t have the money to pay a designer, so what else can I do? Failing elsewhere, I added a page to the site – “Bloggers” – that offered a free year’s subscription to TweetingMachine in return for a review on their blog. Just in case you ever go down this route, you will not believe the cheek of some people. I still regularly receive emails from people demanding free subscriptions, and sending me a link to a copy of a review by someone else. Funnily enough though, in a couple of cases this has led to purchases after I got into an argument – “It’s only $19.99, why don’t you just buy it? !” – with the person originally trying to cheat a subscription out of me. 1) As mentioned, adding more features. Otherwise known as reading my competitor’s websites, and working out how to do what they’re doing, but do it better. 3) Gimmicks. Another embarrassing confession, but honestly – this is how desperate I was. I made TweetingMachine translation-friendly, and then set about adding Google Translate versions of every language I could find. I later realised quite how terrible and irritating the translations were when the visitor logs showed non-English visitors repeatedly choosing the English version of the site, usually after viewing a single page in their native tongue. The pattern of low usage and sales continued over the next few months. I gained 10 subscribers, over half of whom cancelled after a month’s usage… and honestly, I lost interest in the project, now hating the design, and the feature set. One evening though, I got in contact with a friend I hadn’t spoken to in ages. He mentioned a website that was paying his rent, and I expressed my frustration about TweetingMachine’s lack of income. I think at this point, total monthly revenue was $30. Well knock my down with a feather; decent designs are available for not much money at all! My friend had made a great argument. I paid the $50, and got to work. Coming up in part II: turning things around. When will you write next part of this story? P.S. I know how you’ll like to know that someone commented on your blog post :). I’ll be writing up the next part over the next few days, so most likely early next week. Would you like me to send you a mail when it’s up? Please email me when the next section is up. …that’s easy, he’ll be writing the next part as soon as this blog post attracts enough attention to breach the $500/mo threshold. Great story – keep it going!! alas, it was a good read. but please don’t split it! This are the type of stories i want to hear for motivation not the loads of unrealistic blog posts i see around about running an online business, especially marketing an app. Very interesting read, look forward to the next post! Can’t wait for the next installment – compelling stuff. Great write up! Similar experience here, but it didn’t end so well. I think you mean 2009? Would you also share the technologies you used in developing the web application? I have this idea which I wanted to start but I feel stumped on where and how to start my idea. Lovely article. Thank you so much for sharing this. Eagerly waiting for the next one. If its possible can you please drop me mail so that I can check it. I’m not much of a feed reader and I would hate to miss your following posts. Looking forward to part 2. Good idea to buy a cheap theme, I too lack even the most basic design sense/skills, but I hadn’t considered paying for a cheap theme. Hehe, isn’t it annoying how the idea only appears after someone tells you about it? Thanks for writing this. You now have me waiting for part two. If you don’t mind me asking, were you able to purchase the regular license for the admin backend theme, or did you need to get the expensive, extended license? I use the regular license – as far as I’m aware, you only need the expensive extended license if you’re distributing the theme yourself. For using it on a website you should be fine, but if you created an app that people could buy and download all the source files, then you’d need the extended license. I’m really looking forward to the second part of the article. I just started learning android application programming and would like to earn money from it one day. Insights from articles like yours will definitely help in avoiding mis bles along the way. Thanks. If I might ask, what framework did you use, and why? awesome post… Really looking forward to the next installment!! Great post Tom! I’m really looking forward to part 2. You are giving me hope to not give up at all. I am from Pakistan. Though we don’t have facility of PayPal here and I am thinking to set up my account with some payment system for my online earnings. Any advice will be highly appreciated. Desparately waiting for 2nd part. Nice post. After the next installment about your site, you’ll have to write another one describing any material HN effects. Interested to hear the rest ! This is really an interesting post. I’m eager to read the rest. Great read. please send me an email when PARTII is up as well. The world need smore heros like you to tell the truth! good stuff. can’t wait for part II also. Thanks for posting – I’m looking forward to your next post! This sounds a lot like what I’m going through with my web app. I just reached the break even point this month. My day job is taking up all my time now, but I think I can really ramp up sales this summer. I like your design more than the one from ThemeForest. You could have spent a little bit more time on it, and it would look totally fine. Awesome post. It reminds me to think long term instead of wondering why success is taking so long. Also, I really like themeforest. You should consider putting in an affiliate link. I would be more than happy to give you credit when I join. by the way theme on themeforest for SaaS project is the extended version! That site is 1000$ for these types of projects! I’ve just double-checked to make sure that I’m not going mad, and I’m 99% sure I’m covered by the regular license. As ever though, I accept that I could be wrong – can you tell me where you think I’m going wrong? mmmmh… I sware they changed the wording had a few SaaS projects and really wanted to use a couple of those templates. Very inspirational, congrats on your success so far. I’m in the same boat as you, I’m a developer with no design skills. I hacked up a theme I found on TF and wedged my site, http://www.socialdeal.net, to use it so it lost a lot of it’s cohesion. I’m also clinging to the hope that enough revenue can be generated soon to get a better design done. Loved the writeup, please keep going. Finding it very inspiring to read someone with similar tendencies and thoughts go through this adventure ahead of me. I love your intro. Every single web project I start winds up being “tens of thousands a month” in my head too I’m so happy to hear I’m not the only one. What’s even better, is that unlike all my *previous* attempts, this next one that I’m working on right now is going to be that very app that turns into a $10/k per month residual income stream. FYI – theme forest is the developers best friend. Easily modified themes, great designs and really inexpensive. I’m constantly surprised at how many of my great developer friends have never heard of it. Great article by the way, love the honesty and pointing out a lot of the pitfalls you went through. It helps us all who are thinking about doing something like this, to not give up hope. Nice article, can’t wait to read the rest of it. 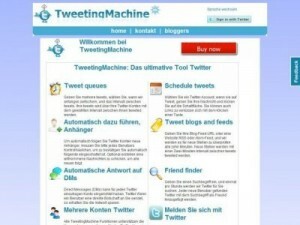 I looked at tweetingmachine.com and the design looks nice. Much better than the initial design, good work! Tom, nice article. I’m waiting for the second part. And yes an overview of the technologies you use would be great. Thanks and keep rocking. Thanks for sharing Tom, you write very well. Woul love to learn more from your experiences, looking forward to the next installment! Nice story! The story abruptly stopped at the most interesting part. I love to read the 2nd part. drop me an email when part II is done if it not too much trouble. I have started many small projects and never finish them. I am curious to see how you keep it going and market the app to make it viable revenue generator. Anyway. Add my email addy to your subscription base too, if it’s not too much hassle. And maybe add a subscribe-me-to-this-series box? I’m off to retweet wherever I found the link to here. On translation: you can get quick, affordable human-made translation on myGengo (http://www.mygengo.com). I don’t work there, though sometimes I do translation jobs there. You can also try oDesk or some other translation site, though there you’ll have to spend more time to find and select a translator. Thanks for a great insight into a web apps beginnings! It does seems to show that the design of a site is as important if not more so than the actual features. Great article! Looking forward to part 2…let me know when it’s up if you don’t mind. You really know how to create a page- turner, huh? “Tune in next time, folks.” I’ll look for the rest of it. Like everyone else, I’m looking forward to part 2. On the net, very few things take off overnight. Way to plunge through despair. Looking forward to how you redesigned with themes, and began earning. Interesting post, looking forward to reading the other parts of it. Like the others have asked, please email me when those are ready. I appreciate how you shared the mistakes made, not just the parts that worked right away. Nice! Like everyone else here, I’m waiting to hear about how things turned out. Man, I bookmarked this a few days ago and part 2 still isn’t here! Enjoyed this post, thanks for sharing. Curious, what framework do you end up using? a month by month story, nice, but you was not stuck during a month? for example : between the idea and the execution? Can’t wait for part II!!! Very interesting to hear the behind the scenes stuff.. would it not be great to hear this kind of success sharing tips from other successful guys too.. Please do finish the article…. I had no idea about ThemeForest, totally worth a look. Wow. I really loved this post. I’ve been working on a site similar to this (when I say similar I mean it has nothing to do with twitter but is a membership site like yours) and loved this post. I’m also using two themes both from themeforest just like you! I’m planning on releasing it soon but as I’m only 16, and I’m new to coding, has taken me quite a few months of work (8 months of on and off work). I’ve bookmarked this post and who knows, when I’m done (hopefully after exams – this summer) I might return! Thanks so much for sharing this (parts I and II). It’s great to hear some “real world” advice and experience from someone building and marketing apps. Nice write-up. It is encouraging to see your effort start paying off. Good luck in your endeavor! Good post, you’ve got a good writing style. Very nice article gives clear information who wants develop their own application. First and the last rule of all successful startups never give up !! The true and harsh reality. Thank you for sharing Tom.